Wondering how to make an envelope? It's really very easy. 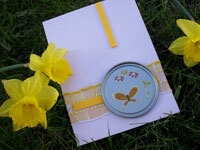 Homemade envelopes are a great way to compliment homemade cards. They also come in handy when you need a special size envelope for any uniquely sized card. I'd like to start by providing this handy card making template for a 4 1/2 x 5 1/2" card. 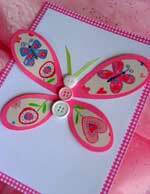 This is a common sized card and easy to make with just a standard 8 1/2 x 11" sheet of paper. I recommend using paper rather than card stock because you don't have to score the folds, plus paper won't add as much weight to your card (this can be an issue when mailing). Note: This card making template is a .pdf file. If you need to download the latest version of Adobe Reader for Free click on the button below. Position. 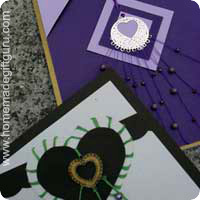 Hold, tape or paper clip template to the paper you choose for your homemade envelope. You can sometimes cut more than one at a time if the paper is thin enough. Cut. Cut around outside of solid line. Fold. Take your envelope paper and fold as indicated by the dotted lines on your template. Note. The solid gray line indicates the size of the card that goes with this envelope. It is shown for your convenience. Adhere. Glue (or tape using double sided tape) side flaps to the folded bottom flap, creating the pocket. Seal Envelope. Adhere top flap down once card is inserted. I like to place a piece of double sided tape inside the upper flap, leaving the protective film over one side until I'm ready to seal the card. Perhaps you need to make an envelope for a special sized card? Below you'll find instructions for how to make an envelope, including a simple formula that I use often. Step 1 Take note of the size of your closed card. Then add 1/8 inch to the height and 1/4 inch to the width. For example, if you have a 5 x 7 inch card, you would write down 5 1/8 x 7 1/4 inches. Note: This will result in 1/8 inch on top and sides (as seen in red below). Step 2 Make 4 flaps that will close together to cover the entire back. Top and bottom flaps must overlap by at least 1/4 inch. The side flaps only need to be wide enough to glue the bottom flap to. Step 3 Fold and attach flaps as follows. Fold up the bottom flap (1). Fold over the two side flaps and glue them down (2). Fold down the top flap (3). Now you've got a custom envelope, made in the exact size, color and/or pattern you choose. I like these homemade bubble envelopes too. When you make your own padded bubble mailers, you can create them to match your homemade greeting cards!